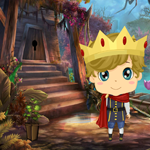 Games4King Cute Little Prince Rescue is another point and click escape game developed by games4king team. In a beautiful forest there was a mysterious mansion between dense trees. It was very intimidating to see. Cute little prince of the country is in that strange mansion. It is your duty to save the prince with all the clues in it. Thank you for the victory of the cute little prince and to win the game.